The original Space Ghost has always been one of my favorite Hanna-Barbera/Alex Toth era cartoons. For the show's anniversary, I played off the idea that the villains in most episodes were either watching or searching for Space Ghost, while usually standing in front of a monitor of some kind. 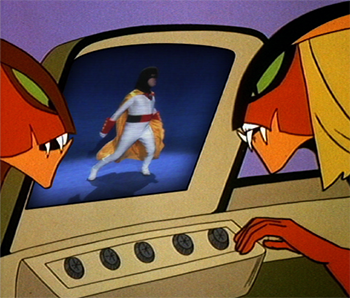 For a humorous twist I also included the Dancin' Space Ghost, performed by Cartoon Planet's Andy Merrill.